It's time for a GIVEAWAY! Woo hoo! When the Because I'm Me Facebook Page hits 900 likes we'll giveaway an item from the shop! What item should it be? Tell us! To be entered: SHARE the original Facebook Giveaway Post (click here to go to that post! ), TAG a friend in the comments of the original post, and tell us what item in the shop we should give away! 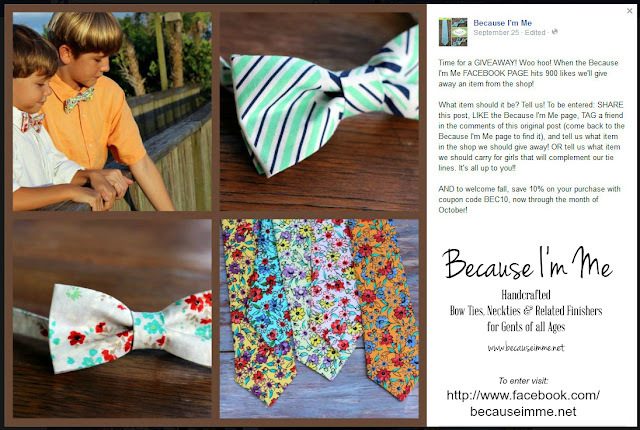 OR tell us what item we should carry for girls that will complement our tie lines. It's all up to you! AND to welcome fall, SAVE 10% on your purchase in the shop with coupon code BEC10, now through the end of October!